In the choice of instrumentalities for the reforming of the church, the same divine plan is seen as in that for the planting of the church. The heavenly Teacher passed by the great men of the earth, the titled and wealthy, who were accustomed to receive praise and homage as leaders of the people. They were so proud and self-confident in their boasted superiority that they could not be molded to sympathize with their fellow men and to become colaborers with the humble Man of Nazareth. To the unlearned, toiling fishermen of Galilee was the call addressed: “Follow Me, and I will make you fishers of men.” Matthew 4:19. These disciples were humble and teachable. The less they had been influenced by the false teaching of their time, the more successfully could Christ instruct and train them for His service. So in the days of the Great Reformation. The leading Reformers were men from humble life—men who were most free of any of their time from pride of rank and from the influence of bigotry and priestcraft. It is God’s plan to employ humble instruments to accomplish great results. Then the glory will not be given to men, but to Him who works through them to will and to do of His own good pleasure. A few weeks after the birth of Luther in a miner’s cabin in Saxony, Ulric Zwingli was born in a herdsman’s cottage among the Alps. Zwingli’s surroundings in childhood, and his early training, were such as to prepare him for his future mission. Reared amid scenes of natural grandeur, beauty, and awful sublimity, his mind was early impressed with a sense of the greatness, the power, and the majesty of God. The history of the brave deeds achieved upon his native mountains kindled his youthful aspirations. And at the side of his pious grandmother he listened to the few precious Bible stories which she had gleaned from amid the legends and traditions of the church. With eager interest he heard of the grand deeds of patriarchs and prophets, of the shepherds who watched their flocks on the hills of Palestine where angels talked with them, of the Babe of Bethlehem and the Man of Calvary. Like John Luther, Zwingli’s father desired an education for his son, and the boy was early sent from his native valley. His mind rapidly developed, and it soon became a question where to find teachers competent to instruct him. At the age of thirteen he went to Bern, which then possessed the most distinguished school in Switzerland. Here, however, a danger arose which threatened to blight the promise of his life. Determined efforts were put forth by the friars to allure him into a monastery. The Dominican and Franciscan monks were in rivalry for popular favor. This they endeavored to secure by the showy adornments of their churches, the pomp of their ceremonials, and the attractions of famous relics and miracle-working images. The Dominicans of Bern saw that if they could win this talented young scholar, they would secure both gain and honor. His extreme youth, his natural ability as a speaker and writer, and his genius for music and poetry, would be more effective than all their pomp and display, in attracting the people to their services and increasing the revenues of their order. By deceit and flattery they endeavored to induce Zwingli to enter their convent. Luther, while a student at school, had buried himself in a convent cell, and he would have been lost to the world had not God’s providence released him. Zwingli was not permitted to encounter the same peril. Providentially his father received information of the designs of the friars. He had no intention of allowing his son to follow the idle and worthless life of the monks. He saw that his future usefulness was at stake, and directed him to return home without delay. The command was obeyed; but the youth could not be long content in his native valley, and he soon resumed his studies, repairing, after a time, to Basel. It was here that Zwingli first heard the gospel of God’s free grace. Wittembach, a teacher of the ancient languages, had, while studying Greek and Hebrew, been led to the Holy Scriptures, and thus rays of divine light were shed into the minds of the students under his instruction. He declared that there was a truth more ancient, and of infinitely greater worth, than the theories taught by schoolmen and philosophers. This ancient truth was that the death of Christ is the sinner’s only ransom. To Zwingli these words were as the first ray of light that precedes the dawn. Zwingli was soon called from Basel to enter upon his lifework. His first field of labor was in an Alpine parish, not far distant from his native valley. Having received ordination as a priest, he “devoted himself with his whole soul to the search after divine truth; for he was well aware,” says a fellow Reformer, “how much he must know to whom the flock of Christ is entrusted.”—Wylie, b. 8, ch. 5. The more he searched the Scriptures, the clearer appeared the contrast between their truths and the heresies of Rome. He submitted himself to the Bible as the word of God, the only sufficient, infallible rule. He saw that it must be its own interpreter. He dared not attempt to explain Scripture to sustain a preconceived theory or doctrine, but held it his duty to learn what is its direct and obvious teaching. He sought to avail himself of every help to obtain a full and correct understanding of its meaning, and he invoked the aid of the Holy Spirit, which would, he declared, reveal it to all who sought it in sincerity and with prayer. “The Scriptures,” said Zwingli, “come from God, not from man, and even that God who enlightens will give thee to understand that the speech comes from God. The word of God . 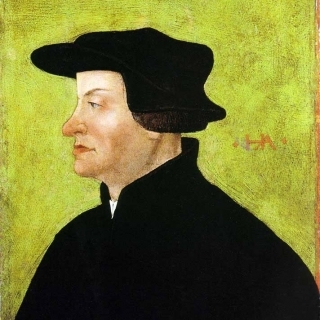 . . cannot fail; it is bright, it teaches itself, it discloses itself, it illumines the soul with all salvation and grace, comforts it in God, humbles it, so that it loses and even forfeits itself, and embraces God.” The truth of these words Zwingli himself had proved. Speaking of his experience at this time, he afterward wrote: “When . . . I began to give myself wholly up to the Holy Scriptures, philosophy and theology (scholastic) would always keep suggesting quarrels to me. At last I came to this, that I thought, `Thou must let all that lie, and learn the meaning of God purely out of His own simple word.’ Then I began to ask God for His light, and the Scriptures began to be much easier to me.”— Ibid., b. 8, ch. 6. The doctrine preached by Zwingli was not received from Luther. It was the doctrine of Christ. “If Luther preaches Christ,” said the Swiss Reformer, “he does what I am doing. Those whom he has brought to Christ are more numerous than those whom I have led. But this matters not. I will bear no other name than that of Christ, whose soldier I am, and who alone is my Chief. Never has one single word been written by me to Luther, nor by Luther to me. And why? . . . That it might be shown how much the Spirit of God is in unison with itself, since both of us, without any collusion, teach the doctrine of Christ with such uniformity.” —D’Aubigne, b. 8, ch. 9. In 1516 Zwingli was invited to become a preacher in the convent at Einsiedeln. Here he was to have a closer view of the corruptions of Rome and was to exert an influence as a Reformer that would be felt far beyond his native Alps. Among the chief attractions of Einsiedeln was an image of the Virgin which was said to have the power of working miracles. Above the gateway of the convent was the inscription, “Here a plenary remission of sins may be obtained.”— Ibid., b. 8, ch. 5. Pilgrims at all seasons resorted to the shrine of the Virgin; but at the great yearly festival of its consecration multitudes came from all parts of Switzerland, and even from France and Germany. Zwingli, greatly afflicted at the sight, seized the opportunity to proclaim liberty through the gospel to these bondslaves of superstition. “Do not imagine,” he said, “that God is in this temple more than in any other part of creation. Whatever be the country in which you dwell, God is around you, and hears you. . . . Can unprofitable works, long pilgrimages, offerings, images, the invocation of the Virgin or of the saints, secure for you the grace of God? . . . What avails the multitude of words with which we embody our prayers? What efficacy has a glossy cowl, a smooth-shorn head, a long and flowing robe, or gold-embroidered slippers? . . . God looks at the heart, and our hearts are far from Him.” “Christ,” he said, “who was once offered upon the cross, is the sacrifice and victim, that had made satisfaction for the sins of believers to all eternity.”— Ibid., b. 8, ch. 5. But another class received with gladness the tidings of redemption through Christ. The observances enjoined by Rome had failed to bring peace of soul, and in faith they accepted the Saviour’s blood as their propitiation. These returned to their homes to reveal to others the precious light which they had received. The truth was thus carried from hamlet to hamlet, from town to town, and the number of pilgrims to the Virgin’s shrine greatly lessened. There was a falling off in the offerings, and consequently in the salary of Zwingli, which was drawn from them. But this caused him only joy as he saw that the power of fanaticism and superstition was being broken. Zwingli’s labors at Einsiedeln had prepared him for a wider field, and this he was soon to enter. After three years here he was called to the office of preacher in the cathedral at Zurich. This was then the most important town of the Swiss confederacy, and the influence exerted here would be widely felt. The ecclesiastics by whose invitation he came to Zurich were, however, desirous of preventing any innovations, and they accordingly proceeded to instruct him as to his duties. “You will make every exertion,” they said, “to collect the revenues of the chapter, without overlooking the least. You will exhort the faithful, both from the pulpit and in the confessional, to pay all tithes and dues, and to show by their offerings their affection to the church. You will be diligent in increasing the income arising from the sick, from masses, and in general from every ecclesiastical ordinance.” “As for the administration of the sacraments, the preaching, and the care of the flock,” added his instructors, “these are also the duties of the chaplain. But for these you may employ a substitute, and particularly in preaching. You should administer the sacraments to none but persons of note, and only when called upon; you are forbidden to do so without distinction of persons.”— Ibid., b. 8, ch. 6. Zwingli listened in silence to this charge, and in reply, after expressing his gratitude for the honor of a call to this important station, he proceeded to explain the course which he proposed to adopt. “The life of Christ,” he said, “has been too long hidden from the people. I shall preach upon the whole of the Gospel of St. Matthew, . . . drawing solely from the fountains of Scripture, sounding its depths, comparing one passage with another, and seeking for understanding by constant and earnest prayer. It is to God’s glory, to the praise of His only Son, to the real salvation of souls, and to their edification in the true faith, that I shall consecrate my ministry.”— Ibid., b. 8, ch. 6. Though some of the ecclesiastics disapproved his plan, and endeavored to dissuade him from it, Zwingli remained steadfast. He declared that he was about to introduce no new method, but the old method employed by the church in earlier and purer times. Already an interest had been awakened in the truths he taught; and the people flocked in great numbers to listen to his preaching. Many who had long since ceased to attend service were among his hearers. He began his ministry by opening the Gospels and reading and explaining to his hearers the inspired narrative of the life, teachings, and death of Christ. Here, as at Einsiedeln, he presented the word of God as the only infallible authority and the death of Christ as the only complete sacrifice. “It is to Christ,” he said, “that I desire to lead you—to Christ, the true source of salvation.” — Ibid., b. 8, ch. 6. Around the preacher crowded the people of all classes, from statesmen and scholars to the artisan and the peasant. With deep interest they listened to his words. He not only proclaimed the offer of a free salvation, but fearlessly rebuked the evils and corruptions of the times. Many returned from the cathedral praising God. “This man,” they said, “is a preacher of the truth. He will be our Moses, to lead us forth from this Egyptian darkness.”—Ibid., b. 8, ch. 6. But though at first his labors were received with great enthusiasm, after a time opposition arose. The monks set themselves to hinder his work and condemn his teachings. Many assailed him with gibes and sneers; others resorted to insolence and threats. But Zwingli bore all with patience, saying: “If we desire to gain over the wicked to Jesus Christ, we must shut our eyes against many things.” — Ibid., b. 8, ch. 6. About this time a new agency came in to advance the work of reform. One Lucian was sent to Zurich with some of Luther’s writings, by a friend of the reformed faith at Basel, who suggested that the sale of these books might be a powerful means of scattering the light. “Ascertain,” he wrote to Zwingli, “whether this man possesses sufficient prudence and skill; if so, let him carry from city to city, from town to town, from village to village, and even from house to house, among the Swiss, the works of Luther, and especially his exposition of the Lord’s Prayer written for the laity. The more they are known, the more purchasers they will find.” — Ibid., b. 8, ch. 6. Thus the light found entrance. Every sin had its price, and men were granted free license for crime if the treasury of the church was kept well filled. Thus the two movements advanced,—one offering forgiveness of sin for money, the other forgiveness through Christ,— Rome licensing sin and making it her source of revenue; the Reformers condemning sin and pointing to Christ as the propitiation and deliverer. In Germany the sale of indulgences had been committed to the Dominican friars and was conducted by the infamous Tetzel. In Switzerland the traffic was put into the hands of the Franciscans, under the control of Samson, an Italian monk. Samson had already done good service to the church, having secured immense sums from Germany and Switzerland to fill the papal treasury. Now he traversed Switzerland, attracting great crowds, despoiling the poor peasants of their scanty earnings, and exacting rich gifts from the wealthy classes. But the influence of the reform already made itself felt in curtailing, though it could not stop, the traffic. Zwingli was still at Einsiedeln when Samson, soon after entering Switzerland, arrived with his wares at a neighboring town. Being apprised of his mission, the Reformer immediately set out to oppose him. The two did not meet, but such was Zwingli’s success in exposing the friar’s pretensions that he was obliged to leave for other quarters. Zwingli had arrived at a clearer understanding of its truths, and had more fully experienced in himself its renewing power. The fall of man and the plan of redemption were the subjects upon which he dwelt. “In Adam,” he said, “we are all dead, sunk in corruption and condemnation.” —Wylie, b. 8, ch. 9. “Christ . . . has purchased for us a never-ending redemption. . . . His passion is . . . an eternal sacrifice, and everlastingly effectual to heal; it satisfies the divine justice forever in behalf of all those who rely upon it with firm and unshaken faith.” Yet he clearly taught that men are not, because of the grace of Christ, free to continue in sin. “Wherever there is faith in God, there God is; and wherever God abideth, there a zeal exists urging and impelling men to good works.”—D’Aubigne, b. 8, ch. 9. Such was the interest in Zwingli’s preaching that the cathedral was filled to overflowing with the crowds that came to listen to him. Little by little, as they could bear it, he opened the truth to his hearers. He was careful not to introduce, at first, points which would startle them and create prejudice. His work was to win their hearts to the teachings of Christ, to soften them by His love, and keep before them His example; and as they should receive the principles of the gospel, their superstitious beliefs and practices would inevitably be overthrown. Step by step the Reformation advanced in Zurich. In alarm its enemies aroused to active opposition. One year before, the monk of Wittenberg had uttered his No to the pope and the emperor at Worms, and now everything seemed to indicate a similar withstanding of the papal claims at Zurich. Repeated attacks were made upon Zwingli. In the papal cantons, from time to time, disciples of the gospel were brought to the stake, but this was not enough; the teacher of heresy must be silenced. Accordingly the bishop of Constance dispatched three deputies to the Council of Zurich, accusing Zwingli of teaching the people to transgress the laws of the church, thus endangering the peace and good order of society. If the authority of the church were to be set aside, he urged, universal anarchy would result. Zwingli replied that he had been for four years teaching the gospel in Zurich, “which was more quiet and peaceful than any other town in the confederacy.” “Is not, then,” he said, “Christianity the best safeguard of the general security?”—Wylie, b. 8, ch. 11. The deputies had admonished the councilors to continue in the church, out of which, they declared, there was no salvation. Zwingli responded: “Let not this accusation move you. The foundation of the church is the same Rock, the same Christ, that gave Peter his name because he confessed Him faithfully. In every nation whosoever believes with all his heart in the Lord Jesus is accepted of God. Here, truly, is the church, out of which no one can be saved.”—D’Aubigne, London ed., b. 8, ch. 11. As a result of the conference, one of the bishop’s deputies accepted the reformed faith. The council declined to take action against Zwingli, and Rome prepared for a fresh attack. The Reformer, when apprised of the plots of his enemies, exclaimed: “Let them come on; I fear them as the beetling cliff fears the waves that thunder at its feet.”—Wylie, b. 8, ch. 11. The efforts of the ecclesiastics only furthered the cause which they sought to overthrow. The truth continued to spread. In Germany its adherents, cast down by Luther’s disappearance, took heart again, as they saw the progress of the gospel in Switzerland. As the Reformation became established in Zurich, its fruits were more fully seen in the suppression of vice and the promotion of order and harmony. “Peace has her habitation in our town,” wrote Zwingli; “no quarrel, no hypocrisy, no envy, no strife. Whence can such union come but from the Lord, and our doctrine, which fills us with the fruits of peace and piety?”— Ibid., b. 8, ch. 15. Seeing how little had been accomplished by persecution in suppressing Luther’s work in Germany, they decided to meet the reform with its own weapons. They would hold a disputation with Zwingli, and having the arrangement of matters, they would make sure of victory by choosing, themselves, not only the place of the combat, but the judges that should decide between the disputants. And if they could once get Zwingli into their power, they would take care that he did not escape them. The leader silenced, the movement could speedily be crushed. This purpose, however, was carefully concealed. Thus Zwingli maintained the battle with his wily antagonists. He “has labored more,” said Myconius, “by his meditations, his sleepless nights, and the advice which he transmitted to Baden, than he would have done by discussing in person in the midst of his enemies.”—D’Aubigne, b. 11, ch. 13. At the conference, “Eck haughtily ascended a pulpit splendidly decorated, while the humble Oecolampadius, meanly clothed, was forced to take his seat in front of his opponent on a rudely carved stool.”— Ibid., b. 11, ch. 13. Eck’s stentorian voice and unbounded assurance never failed him. His zeal was stimulated by the hope of gold as well as fame; for the defender of the faith was to be rewarded by a handsome fee. When better arguments failed, he had resort to insults, and even to oaths. Oecolampadius, modest and self-distrustful, had shrunk from the combat, and he entered upon it with the solemn avowal: “I acknowledge no other standard of judgment than the word of God.”—Ibid., b. 11, ch. 13. Though gentle and courteous in demeanor, he proved himself able and unflinching. While the Romanists, according to their wont, appealed for authority to the customs of the church, the Reformer adhered steadfastly to the Holy Scriptures. “Custom,” he said, “has no force in our Switzerland, unless it be according to the constitution; now, in matters of faith, the Bible is our constitution.”— Ibid., b. 11, ch. 13. The contrast between the two disputants was not without effect. The calm, clear reasoning of the Reformer, so gently and modestly presented, appealed to minds that turned in disgust from Eck’s boastful and boisterous assumptions.